The Arkanoid series are a line of Taito games inspired by Atari’s Breakout games of the 1970s. Now part of Square Enix, Taito recently revived the series and released the highly impressive Arkanoid DS. Hirokazu Koshio and a team of guest contributors created a memorable and fitting score for the title that was commemorated with a soundtrack release by SuperSweep. 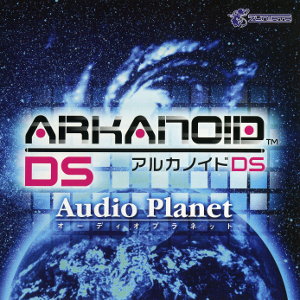 Arkanoid DS still maintains some of the sound of the Arcade game. The music continues to have a light and refreshing feel, albeit with a more electronic tone, while the incorporation of sound effects use sometimes adds a retro feel. Furthermore, a number of jingles and pieces from Hisayoshi Ogura’s original score to the original Arkanoid are arranged. The game opens with an apocalyptic arrangement of the opening music from the Arkanoid, for instance, while “Revenge of Arkanoid” is a delightful chillout mix of one of the central themes from the original game. These little homages certainly bring some nostalgia and also ensure the score is a thematically rich one. That said, the general direction for Arkanoid DS is quite modern and experimental. Tracks such as “shining eyes”, “Neptune-Diving”, and “Pluto-Fighting” have a strong electronic focus to them. Unlike Hirokazu Koshio’s tracks from the Space Invaders series, however, they are still very melodic and expressive. “Neptune-Diving”, in particular, is a gorgeous blend of synthpads and aquatic elements that brings the very most of the DS. “Pluto-Fighting” is also extremely welcome for its incorporation of the main theme for the game. Perhaps one of the most interesting features of the album is its use of vocal elements. Voice samples are used quite extensively throughout the album and there are several streamed vocal themes used during the main gameplay. “Planet Connection” and “Happy Smiling” are reminiscent of Bemani’s more ethereal themes with its blend of electronic elements and uplifting vocals. The former is especially pleasant. A Bemani artist also makes a direct contribution in “Fairy Reflection”, a highly upbeat and anthemic dance track used to round off the album. Neither of these main themes have the best lyrics or vocalists, but they’re still pretty well-composed and work well in their context. Jazz tracks from several guest contributors also help to define the unique tone of the album. Kemmei Adachi’s “too much funky?” is full of rhythmical impetus and sleazy leads, while Takafumi Wada’s “missing & love future” offers a gorgeous acid jazz soundscape. There are two other guest contributions of potential interest. Mitsugu Suzuki contributes the most intense tracks on the album with “Heat Sink” and “Dash”. Both are fairly good hard rock pieces that add to the diversity of an already multifaceted album. Finally, Shinji Hosoe offers a nod to another of OGR’s great scores — Darius — with a fine remix of “Captain Neo” and several others. This is a distinct track from his contributions to Darius Remix. Few game scores manage to simultaneously be fresh and nostalgic, but Arkanoid DS somehow achieves this. It has a lot of strengths, from its stylistic diversity, to its strong melodies, its excellent implementation. The resultant sound is fitting for the gameplay of the Arkanoid series and, thanks in part to an exuberantly presented package by SuperSweep, it is delightful to listen to out of context too.